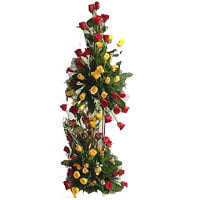 Online delivery of best wishes along with this Impressive 100 Colorful Tall Preparation Roses for your dear ones. 100 Super Roses in Tall Arrangement with 500 grms Assorted Sweets. 100 Super Roses in Tall Arrangement with 16 pcs Ferrero Rocher chocolate box.